Tony is a retired engineer. Following ill health and emergency surgery to remove part of his bowel, he underwent an abdominal wall reconstruction with Biodesign Hernia Repair Graft. Tony is sharing his story through a series of posts on this blog. Read the first post here. How did you come to hear about Cook Medical? Were you surprised when you learned that the graft was derived from the submucosa of pigs’ intestinal linings? Note: This story reflects the experience of one individual. 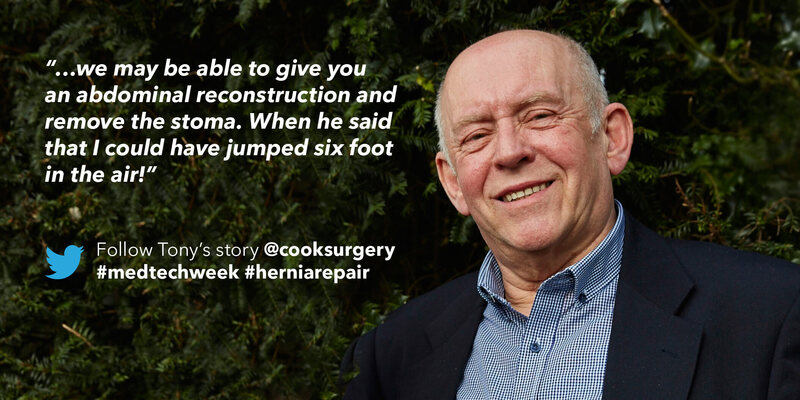 Every hernia-repair case is unique. We at Cook can’t guarantee that every patient will experience the same level of success. Information included in this article should not be used as the basis for any treatment recommendation. This post is intended for US audiences only.